Marc Faber, publisher of the Gloom, Boom & Doom Report, appeared on Bloomberg Television today to discuss the state of the Chinese economy. 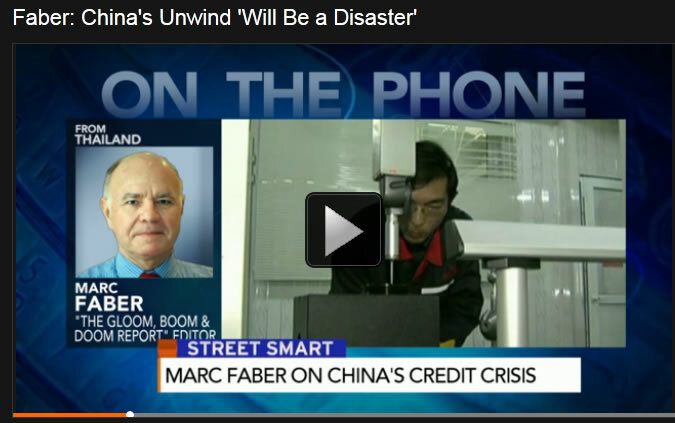 Faber told Trish Regan and Matt Miller "I think that we had a colossal credit bubble in China and that this credit bubble is now being gradually deflated....if I look at export figures from China, and they are very closely correlated to overall economic growth, then there is a huge discrepancy between what China reports and what China's trading partners are reporting." He said, "There's lots of funny things that are happening in China. And when the whole thing unwinds it will be a disaster." TRISH REGAN: China's currency fell to an 11-month low after China's central bank doubled the yuan's daily trading range against the dollar. The decision to allow greater exchange rate fluctuations comes at a time when China's economy is showing some serious signs of losing momentum. The government is targeting a 7.5 percent growth rate. That's actually the slowest since 1990. But leave it to the author of Gloom, Boom and Doom, that report, to say that it will likely be a little more than half that. Marc Faber joining us right now on the phone. Marc, always good to talk to you. Somewhat depressing at times, but we're calling - or you're calling here for 4 percent growth out of China this year. Why? MATT MILLER: Hang on. So Marc, are you calling for a Chinese report of 4 percent or are you saying it's more realistic that we'll see 4 percent and the Chinese will come out with a report or their own numbers that are closer to the 7, 7.5 that's expected? FABER: Governments will always publish the statistics that they wish to show irrespective whether that is in China or in other countries. Governments control basically the statistical offices, so they can show whatever they want. As Stalin said, it's not important who votes but who counts the votes. And the government counts the statistics. FABER: Look, the fact is simply that Chinese stocks have been just about the worst performing stocks since 2006. Now analysts will dismiss that and say everything is prefect in China, but the stock market does not seem to believe everything that the government is saying about the economy. And clearly there are strength signs in the Chinese economy. In particular, as I said, we have this huge explosion of debt. Debt as a percent of GDP has increased in the last five years by more than 50 percent. Total debt is now over 215 percent of GDP, and a lot of it is trade finance that is being rolled over. MILLER: Well surely they can do that kind of thing within their own borders and kind of keep a lid on it. But as you say, if there are discrepancies with their export numbers and say Taiwan's import numbers, or if indeed we see all of their export numbers dropping, all of their import numbers dropping more importantly, it could portend disaster for the rest of Asia. Do you see that sort of playing through, those ripples playing through Asia this year? FABER: Yes. I think that investors are not sufficiently aware that the Chinese economy is far more important for other emerging economies than the United States because China is a large importer of resources. In other words, iron ore, copper, zinc (inaudible). And at the same time, they are a huge exporter to commodity producers of their own manufactured goods, as well as Korean exports. The commodity producers are much larger than Korean exports to the US or to the U (ph). So if the Chinese economy slows down, commodity prices - industrial commodity prices are likely to remain under pressure. They already come down a lot. They remain under pressure and the resource producers have less money. In other words, the Brazilian goes into recession. The Middle East does not grow as much as before. Central Asia, Africa and so forth all contract, and then they buy less from China and you have a vicious cycle on the downside. REGAN: Let's talk about what's going on over in eastern Europe right now as we watch Vladimir Putin take over Crimea. How - how big might this get in your view and how should investors be thinking about Europe right now as a result of these moves from Putin? REGAN: I'm sorry. He did the right thing at the right time. What do you mean by that, Marc? REGAN: So he - he needed to save his warm water ports? He went in and took over this region, which you see as a logical political move. I guess the big question is is he going to do more. FABER: The Crimea is strategically most important for Russia. It has practically no meaning strategically to the United States or to Europe. But for Russia it's very important. I don't think that Russia will move further into Ukraine unless there is serious provocation. But I doubt it will happen. But I think the wider implication is that we have now border lines. In other words, the US would intervene if a foreign power would establish bases in Haiti and in Cuba and so forth and so on, and the Chinese will react if foreign powers threaten Chinese access to resources. MILLER: Gloom, Boom and Doom. MILLER: And Marc, I hope we can get you back here in the studio soon. Always a pleasure talking with Marc Faber.